I recently attended the Forum on Workplace Inclusion, held in Minneapolis, USA, where I was privileged to present a paper on Symmetra’s program to Embed Psychological Safety in the Workplace. One of the aspects I sought to emphasise in Symmetra’s proposition is that a psychologically safe environment is one where opposing views and differences can be aired without fear of comeback and that this is an important element of building innovative organisations. Somewhat fortuitously, a keynote speaker at the conference was Van Jones, a high profile presenter on CNN and public speaker of note. Jones is an open supporter of the Democratic Party but he campaigns for a degree of civility and rationality from competing participants in all political controversies. His address explored the current very polarised nature of US political discourse and the vast and seemingly unbridgeable gap which separates the two main political parties. The point he made is that politicians on both sides and their supporters are intent on point-scoring against the opposition rather than listening to the arguments and weighing them up to see what can and what cannot be agreed upon. He spoke of “constructive disagreement’ which requires listening to the points made by others even if the views expressed are unacceptable or repugnant. In many ways, of course, the kind of dogmatism of which Van Jones speaks is now unfortunately typical of many public figures in Australia and other Western countries. It is also a function unfortunately of many leaders steeped in the belief that the way they have always done things is the only way. This led me to thinking about the connection between my paper on psychological safety and the argument advanced by Jones. His premise is essentially that listening to someone else with a view to extracting what is positive and valuable from what they say, rather than as a prelude to a rebuttal, is a valuable way to grow and move ahead. This notion underpins the theory of Amy Edmundsen’s work on psychological safety which is that sharing views and learning from failure rather than attributing blame is the hallmark of successful teams. In the political sphere a reluctance to listen to the other side simply means that politicians talk past each other. In the business and organisational sphere, a sense that one will not be listened to simply limits or shuts down potentially valuable interactions and wastes the full value of the intellectual capital that organisations work so hard to recruit. The common thread which runs through any sound initiative to promote constructive interaction is that of ‘dialogue’. Dialogue is not the same as discussion. Dialogue comes from the Greek ‘dialogos’ – or ‘through the word’. It implies a stream of shared meaning flowing between participants. “Dialogue is a basic process for building common understanding. By letting go of disagreement, a group gradually builds up a shared set of meanings that make much higher levels of mutual understanding and creative thinking possible”. A culture which creates a platform for successful dialogue is one where psychological safety will be pervasive which, in turn, will result in greater creativity and innovation. Those who have an interest in fostering more inclusive organisations can take a huge step forward by helping to facilitate the art of dialogue. 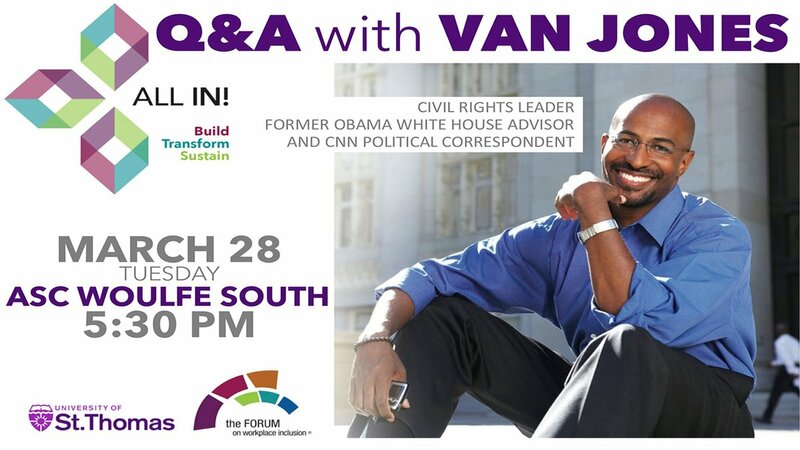 As a consultant in the field of diversity and inclusion, I take heart from the very significant input of someone like Van Jones. It reinforces some of the basic precepts which we at Symmetra have endeavoured to embody in our various service offerings – that listening well and encouraging genuine dialogue is a major building block of high performing organisations.